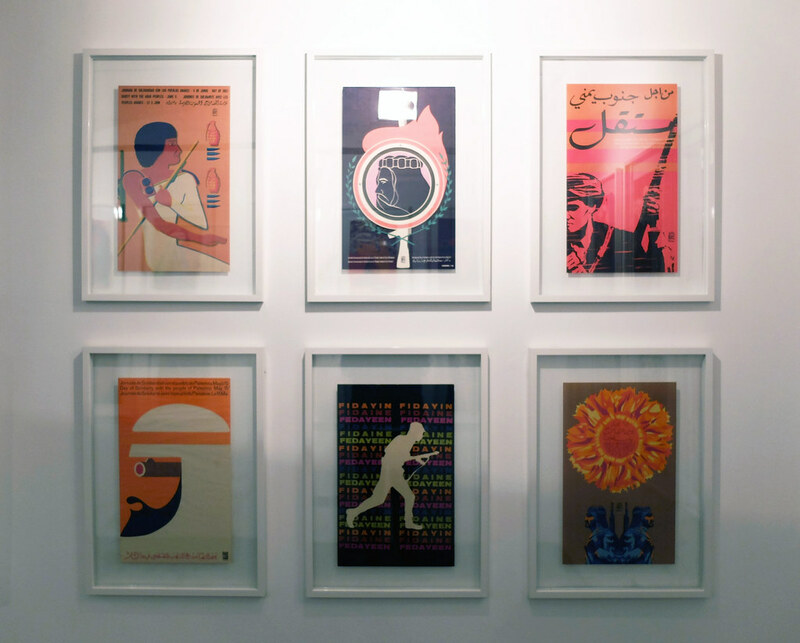 The Cuban OSPAAAL posters in Kemistry’s show pack a macho sense of déjà vu, says Colin Davies. Walk into Kemistry’s OSPAAAL exhibition in Shoreditch and you might be hit by the Cuban posters’ familiarity – there’s a sense of déjà vu, writes Colin Davies. Apart from a brief leaflet, the 30-odd framed items are presented in the intimate space without context: the absence of names and dates forces you to ‘join the dots’. Like fathoming a face not seen for a decade or more, you slowly begin to recognise each poster: a shade of red, the curve of a typeface, a smile. Susan Sontag once noted, in an essay to accompany a book on Cuban political posters, the ‘graphically sensuous way’ these posters open up. So have these old acquaintances stood the test of time? Do they have anything to say to us today? One striking element is the subtle machismo of the collection. Revolution has a chiselled chin. Part of this virility comes from the appropriated visual language. Sontag pointed out the eclectic mix of styles in the Cuban poster – no didactic Constructivist rules, Futurist pledges or Bauhaus nomenclature, more a range of political aspirations influenced by the advertising in pre-revolutionary Cuba and the contemporaneous Western visual codes. Alfredo Rostgaard, ‘Santo Domingo: 1965’, 1970. Top: Kemistry Gallery wall, 2014. 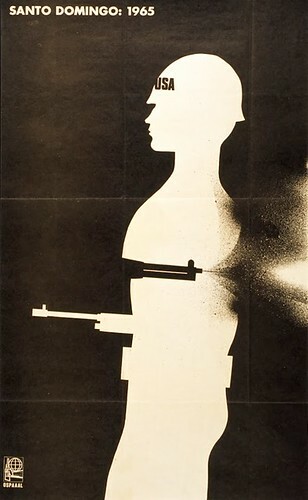 Gun imagery, as in the ‘Santo Domingo: 1965’ poster, aestheticises oppression and weapons in a way we might now call Tarantinoesque. 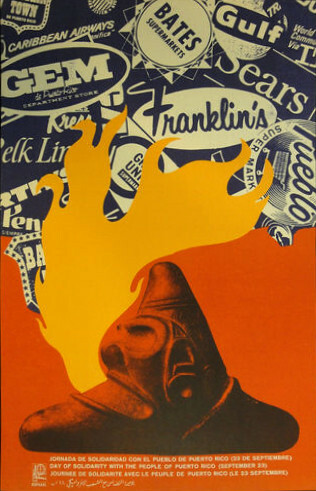 The poster depicting a bonfire with flames engulfing a tumbling array of company logos – from Sears to the petro-chemical companies – seems knowing and remarkably contemporary. Faustino Perez & Ernesto Padron, ‘Day of Solidarity with the People of Puerto Rico’, 1968. 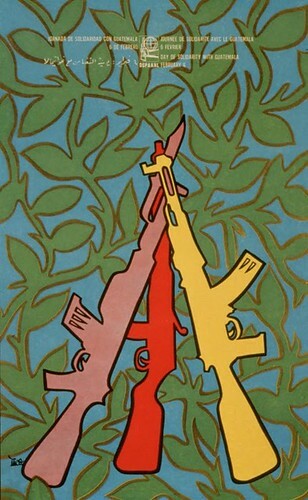 Similarly, the poster for the ‘day of Solidarity with the People of Venezuela’, has a vernacular style that articulates the empowering symbol of the gun. Faustino Perez, ‘Day of Solidarity with the People of Venezuela’, 1969. The same dynamic is in the Guatemala posters, too. Context is everything: many of these images would be perfectly readable at a NRA convention! (The OSPAAAL logo itself contains the visual matrix of gun and freedom, as does the NRA logo). Antonio Marino, ‘Solidarity with Guatemala’, 1970. And this is the problem of the poster in politics or in the arena of cultural critique: if it does not follow any didactic system it will inevitably become immersed in the laissez-faire straits of style and fashion. The posters in this exhibition use the same visual rhetoric seen in the ‘Head shops’ populating the bay area of San Francisco in the late 1960s and 70s. 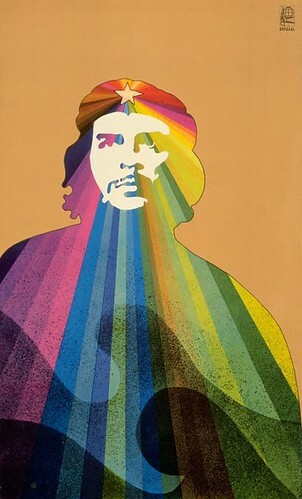 Theobold, who produced a famous screenprint of Peter Fonda in Easy Rider, could have produced the poster of Che Guevara used as the exhibition poster. Alfredo Rostgaard, ‘Radiant Che’, 1969. 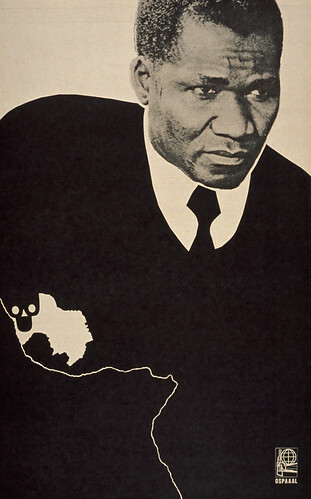 The 1971 poster of Ahmed Sékou Touré, first president of the Republic of Guinea (and lifelong trades unionist), steps out of the milieu of advertising. The poster’s style seems influenced by black freedom fighters in the US, the Black Panthers, the civil rights movement and Emory Douglas. 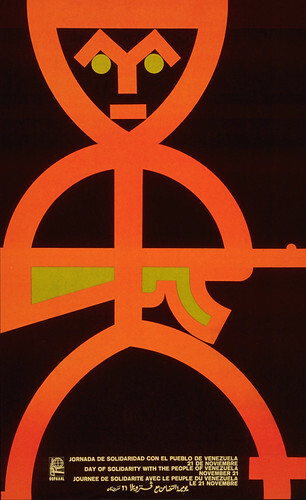 Alfredo Rostgaard, ‘Ahmed Sékou Touré’, 1971. Douglas’s influence on OSPAAAL (Organisation in Solidarity with the People of Africa, Asia and Latin America) is implicit in this poster. Both agencies tried to capture a visual form, which was authentic and recognisable to their audience. Douglas produced a more coherent visual narrative, referencing John Heartfield’s collage and vernacular graffiti; whereas the posters in this exhibition capture the eclectic nature of the output of Alfredo Rostgaard and others. A critique of Modernism – for these posters are certainly Modern – could be its preoccupation with freedom rather than power. Freedom here is simply defined as escaping Capitalism, while power is unproblematic, masculine and wields a gun. 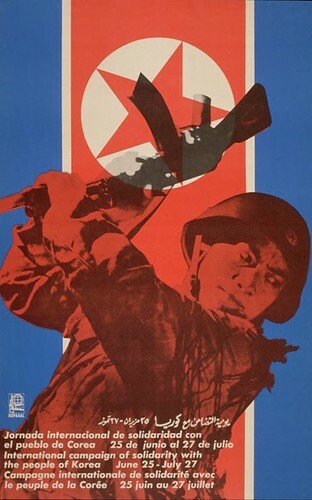 Gladys Acosta, ‘International Campaign of solidarity with Korea’, 1969. 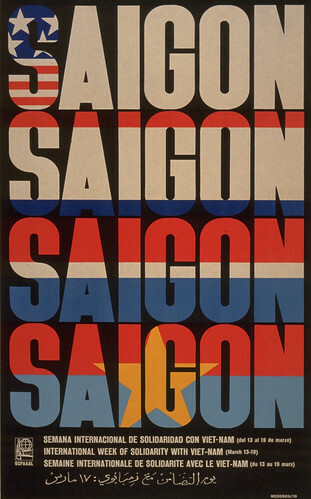 Rene Menderos, ‘Saigon: Week of solidarity with Viet-Nam’, 1970. Hi-res scans courtesy of Lincoln Cushing / Docs Populi. 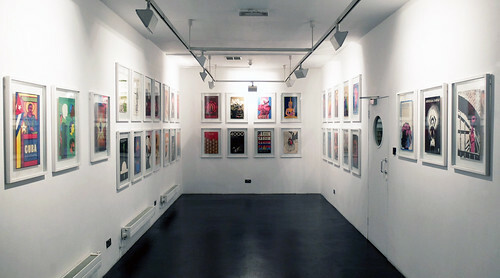 OSPAAL Posters Show, Kemistry Gallery, 2014.